We describe a computer model of general effectiveness of a hierarchical organization depending on two main aspects: effects of promotion to managerial levels and efforts to self-promote of individual employees, reducing their actual productivity. The combination of judgment by appearance in the promotion to higher levels of hierarchy and the Peter Principle (which states that people are promoted to their level of incompetence) results in fast declines in effectiveness of the organization. The model uses a few synthetic parameters aimed at reproduction of realistic conditions in typical multilayer organizations. It is shown that improving organization resiliency to self-promotion and continuity of individual productiveness after a promotion can greatly improve the overall organization effectiveness. Computer simulations have become increasingly popular in describing social phenomena, from traffic jams to opinion formation. The number of topics and works is very large and there are even popular expositions of the discipline, such as Ball (2004). In some cases the new tools provide significant insight into observed phenomena. In some others the simulations may add a level of understanding into already formulated explanations of real world phenomena. In this work we present a computer model of general effectiveness of hierarchical organizations, focused at effects of individual effectiveness of employees. The model aims at extending the the famous Peter Principle (Peter & Hull 1969): "In a hierarchy every employee tends to rise to his level of incompetence". Thus in any hierarchical organization global effectiveness is diminished due to the fact often skills which make a person an excellent worker at a given level in the organization may be unsuited at a higher one. Promotion of the best employees (which looks like a reasonable way of action from the point of view of employee recognition and motivation) results in loss of skilled workers and, possibly, creation of less than optimal managers. Of course, such ineffective manager would no longer be promoted, so eventually everyone would become stuck at their level of incompetence. Peter originally formulated this idea in a joke-like fashion, but once we recognize its importance, it becomes pretty obvious and common sense. It should be noted that companies fight against the “incompetence stasis” resulting from Peter Principle via constant pressure on employees: promoting the best is usually accompanied by firing the worst performers at each level of hierarchy. But while this leads to culling of non-performers, it might mean loss of capable lower level employees who have been promoted beyond their skill range. The process creates a bad manager from a good worker, and then gets rid of the bad manager. This problem can in turn be solved by providing horizontal career paths, which ensure that the best specialists could be recognized and awarded without changing the nature of their tasks, so that their skills would not be lost upon promotion. Yet, despite the fact that Peter Principle is known for forty years, examples of loss of productivity due to promoting people beyond their capacities are present in almost all types of hierarchical organizations, from scientific research to commercial companies. The topic has already been studied well beyond the original witty insight. Mathematical analyses appeared as early as one year after the original book (for example Kane (1970)). The topic is quite actively researched. For example, a computer model of Peter Principle in action has been recently published by Pluchino et al. (2010), while earlier works on the topic include Fairburn & Malcomson (2001); Lazear (2001); Lazear (2004); Dickinson and Villeval (2007). In this paper we attempt to go beyond the earlier approaches, which assume that the basis for promotions is the actual performance of the organization members. Our motivation comes from experience that decisions to hire and promote are based on perceived performance. Thus, employees or external candidates who focus on presenting themselves and their own results in good light (instead of just working) have better chances of advancement. Such individual public relations activity or self-promotion is quite natural and present everywhere: in commercial companies, universities or political parties. The result is that not only people reach their incompetency level, but also that the whole promotion process often focuses on those who have little to contribute to the organization but rather direct their efforts to (and spend their time on) getting promoted, attempting to cheat the evaluation systems based on measurements of performance. The observation has been made by Scott Adams (Adams (1996)), who, discussing Peter Principle, remarked that "incompetent workers are promoted directly to management, without ever passing through competence stage". While the negative effects of Peter Principle are beyond doubt, as Adams observes, Êit provided a boss who may not understand his present job, but at least understood that of his subordinates. If promotions not only change the nature of the required skills but also depend on superficial characteristics, presented for the benefit of the people who decide promotions, the results can be, and often are, much worse. This combination of the two phenomena, which we propose to call the Dilbert-Peter Principle limits the effectiveness of organizations. The name has already been used by Faria (2000). It might seem presumptuous to use fictitious Pointy Haired Boss and other characters featured in the Dilbert strip as “real world” basis for computer modeling. Would it not be better to use official company data, histories and performance figures as a source for inspiration for a simulation model? In our opinion, just the contrary. The official documents are usually written with the purpose of hiding the very mistakes and ineffectiveness we want to discuss. On the other hand, due to the popularity of the strip and its web site( http://www.dilbert.com), the accumulated “database” of cases of stupidity and mismanagement is much better and true to life than the official corporate profiles and annual reports. Author's own experience gathered in the course of over 15 years of work in several commercial companies (Polish, American, German and French) and more than ten years within an academic institution, suggests that Dilbert jokes are often an uncannily accurate descriptions modern organizations. Thousands of letters sent to Scott Adams from all over the world confirm this experience. In many areas we find organizations which share similar activities, sizes and structures, yet which differ widely in their effectiveness. This is true for both commercial companies and public organizations. Our goal is to find which which aspects of the model are crucial in determination of the overall productivity, and perhaps to suggest measures to improve the operations in real life. The purpose of the model is to provide a simplified description of effectiveness of a hierarchical organization in which people act to maximize their promotion chances. The promotions are achieved through comparisons of individuals within a given hierarchy level. This is similar to internal tournament models, introduced by Lazear and Rosen (1981). Before we discuss further, a brief note about the meaning of productivity is needed here. We follow Pritchard (1990), who discusses broad range of meanings of the term, used to note output, individual performance, production, profitability competitiveness, work quality of individuals, groups and organization units. Prichard equates productivity with efficiency or effectiveness, defines as measure of outputs divided by inputs and by relationship of outputs to some standards. One of the key differentiators of the model is the division between real or effective productivity (for example sales results, number of research publications, lines of code accepted into a project) and perceived productivity, as seen by the authorities responsible for making promotion decisions. While the effectiveness of the whole organization is measured by accumulating the real output of the contributors, their advancement within the organization is related to comparative perceived results. Observations show that often it is not the best performer that gets promoted (as postulated by the original Peter Principle) but those who appear to be the best workers. In our model we assume that all employees are trying to get promoted. The actual incentives (increased salaries, more power and status etc.) and benefits are not discussed. We also assume that the employees understand the real productivity/perceived productivity difference and have therefore the two main strategies to achieve promotion. The first is via improvement of the real output, based on hope that it would be noticed and rewarded. The second strategy, observed all too frequently, is through the use of political games, thanks to which a person appears to be more productive and worthy of advancement. This is an extension of the classical approach in which employees signal their abilities by means of an effort display (MacLeod and Malcolmson (1988)). Here, the effort might be in pure signalling, with less focus on the actual job in hand. Such difference has been stressed many years ago by Spence (1973), who remarked that while job applicants can do little about their actual results and indices measuring them, signals are under employee control and can be subject to manipulation. In many cases, these individual PR activities are done at the expense of the actual work, thereby decreasing the contribution of the individual to the overall organizational effectiveness. Within the model, each agent has a fixed “psychological makeup”, deciding on the actual mix of strategies used. In contrast to real life, agents can not modify their behavior. But, as we are interested in checking who gets promoted and how the process of promotion determines the composition of management levels and overall productivity of the company, keeping agents' characteristics fixed seems a reasonable simplification. Following Pluchino et al. (2010) we propose to compare two possible scenarios, differing in description of individual productivity after the promotion. The first one, called continuity scenario ('common sense' in Pluchino et al. (2010)), in which the productivity at the new post is similar to the one at the previous one. Such situation is expected when the range of tasks related to the new position remains similar to the previous ones. The Peter scenario assumes that due to difference in tasks at different levels of the organization the productivity at the new post is unrelated to the old one. In both cases our current model measures the perceived productivity, including effects of internal politics. We investigate the effects of promotion process on key characteristics of the organization: its general productivity, averages of effectiveness at various levels of the hierarchy, dynamics of changes due to the promotion preferences. The simulations presented here are designed to include several phenomena associated with modern enterprises and organizations, namely hierarchical organization, management contribution, measurements of effects dependent on both individual qualities and cumulative results of subordinates and interplay between in-company promotion and external hiring. The goal of the model is to provide some predictions regarding the dependence of the measured qualities on a few simple controls: importance of the political gamesmanship for promotion, heritability of skills after promotion (the continuity model versus Peter hypothesis) and tendency for internal or external advancement. Presented results are based on a small number of selected conditions and, we hope, can be a starting point for a more advanced study. The basic model applies to organizations in which activities are uniform, i.e. where the nature of tasks is the same for all positions at a given hierarchy level. Examples might be provided by some government institutions (such as tax offices), research institutions or by specialized parts of larger bodies, for example sales divisions in large corporations. While the basic tasks and measurement criteria per level are comparable throughout the organization, advancing from one level to another might change (sometimes very significantly) the nature of the job: from tax collection or sales to management, more and more remote from the outside world as we move up in hierarchy. We are interested here in department based hierarchical organizations, such as a commercial company with many local sales offices, or large software house with multiple project teams. To a certain degree this description applies to research and government institutions as well. The simplest way of modeling such organization is via pyramid structure of units of the same size. Organization is divided into levels, numbered from top ( ). Each unit consists of a manager at level and subordinates (workgroup) at level . With the exception of the topmost executive, each employee has exactly one direct manager and each manager has exactly subordinates. The size of the whole organization is thus . To achieve reasonable number of levels and unit sizes we may restrict ourselves to and or , resulting in organizations with enough structure and with size greater than 500 people. This corresponds to businesses above the "Small Business" definition as described in U.S. Small Business Administration Table of Small Business Size Standards (2008) The size has been chosen to allow statistical effects and relative anonymity of employees to play significant role in the organization. In small companies the closer connection between employees and those responsible for promotion decisions often allows better recognition of actual performance and competences, diminishing effects of Dilbert-Peter Principle. Employees are represented by computer agents numbered via subscript . Each agent is characterized by two parameters. The first, , is its capacity to perform real work at its current position, called also raw productivity. We consider here two types of contributions: direct work (for example value of sales achieved by a salesman, lines of code written by a programmer or research papers published by a scientist) and managerial contribution, related to organizing, coaching and monitoring efforts of others. Managers, by their actions, may significantly influence the sum of individual results of their subordinates. This would correspond, to use the above examples, to overall sales figures for a branch office, code submitted by a software development group or the research standing of a university department. We have decided to combine the two contributions into one parameter, to keep the spirit of Peter principle, defining one "competence", as appropriate for a given position. The second characteristics of an agent is the effort he or she puts into internal political positioning (self-promotion) denoted by . This parameter may include activities and skills that are quite commonplace in modern organizations, for example twisting the facts to present one's own results in a good light (“Power Point economy”), doing the opposite with respect to other employee achievements, forming and nurturing of cliques and power circles. We consider here that effort is focused on personal interest of the agent and does not contribute to actual results – neither those related to direct output, nor to management contributions. In this work we separate the “productive” part of political activities (such as organizing, motivating, ensuring cooperation...), being an inherent part of management activities and contributing to the real work done, from activities aimed at personal gain. This is a simple way of describing the fact that focusing on improving one's own position by political activities must deduct some time from the time spent on actual work effort. On the other hand, effort spent on political maneuvers improves the perceived results. This is described in a more complex way, depending on additional parameter: organization's susceptibility to self-promotion (Eq. 3). Similar trade-off between technical and social skills has been proposed by Faria (2000). It should be noted, however, that in our approach contains both the technical and social skills as defined by Faria. The change of responsibility upon promotion might result in a different optimal ratio of the two types of skills, and therefore, in different value of before and after promotion. We have used values of in the simulations. This choice has been motivated by the use of multiplicative approach to management contribution (discussed in the next section). The width of the Gaussian distribution of capabilities used in results presented in this article was, . Such distribution of allows occasional differences of individual productivity in the range of 200% or even more. The treatment of is different: it measures an internal characteristic of a person, its drive to improve own position, which does not improve the actual results in any way and has not been considered in the past. The choice of flat distribution reflects relatively frequent cases of extreme behavior: from total lack of focus on self-promotion to giving it large part of the total effort of the employee. Author personal experiences lead to assumption of ; there are people who do spend more than half of time on political ploys aimed to advance their position. is a fully adjustable parameter of the model. Moreover, it should be remembered that within the model of a given agent is not changed when the agent is promoted to a higher level. where denotes the agents that are directly managed by agent . Due to recursive nature of the above expression, the effective results of a manager include contributions of all its subordinates. For the lowest level of hierarchy . In such model, if all agents have the same value of and (no effort is wasted on political positioning) the results at a given layer are , assigning much greater importance to the managers that in the additive model. But if then the manager decreases the summed contributions of his or hers subordinates. Such model does not describe well situations where a manager combines the managerial tasks with the same type of production as his or her subordinates (e.g. programming team leader writing code, university department head doing his or her own research or sales manager being directly responsible for some customers). However, above certain realistic size of the workgroup, the qualitative results of our model remain unchanged by such assumption. where is the average result at the level of the agent . is a numerical factor used to model self-promotion importance - one of the key parameters in the simulations. We use the name “susceptibility” for , as it determines the relative importance of self-promotion in the selection of candidates for promotion, and thus the way the organization responds to self interests of employees. Such form of the perceived results allows normalization of its two components independently of the level, number of subordinates etc. Agents with highest and lowest values of would be the candidates for promotion and sacking, respectively. The overall outcome of the political activities on the real and perceived results of an agent at a given position are simply: increase of leads to decrease of real contribution but increase of the perceived one. Depending on the value of playing politics may prove to be advantageous - or not. As it turns out the result depends on the level of the organization, making the model more life-like. To model the processes of promotion in an organization we need to provide some assumptions as to the personnel mobility within it. This requires balancing between model simplicity and the need to cover realistic situations. The rules proposed apply to organization levels . For the top level, there is no competition and no hiring/firing. Real organizations certainly experience changes at the CEO level, and such changes can bring large differences in the overall performance. Charismatic leaders, by their vision and management skills can radically change the evolution of their companies. Such contributions are, however, impossible to simulate in a statistical computer model. Our goal is to model internal competition and promotion mechanisms within an organization, coming from lower levels. To allow such focus in our simulations we have assumed that the top manager has no influence on the overall productivity, having , and . At lower levels the firing and promotion scheme easier to simulate. At each simulation step there is some chance (given by parameter ) that from each workgroup of employees one would be fired. Thus the typical churn rate is the same at every level, being given by , and the reason for introducing is to allow adjustment of the rate of change in the model. This would allow the “simulation time” to reflect actual time for real organizations - we selected equal to 0.05, for which a single simulation step (corresponding to 3 months "real time") gives realistic ratio of fired employees. For comparison the U.S. Bureau of Labor Statistics reports in Job Openings and Labor Turnover Survey that the layoffs and discharges monthly rate for the period between 2000 and 2009 varied between 1.2% and 2%. The rate calculated with our model parameters is 0.33%, but it should be remembered that our model does not include mass layoffs and discharges due to disability or illness. While the chance of firing is probabilistic, the choice of the agent to be fired is almost-deterministic: the worst perceived performer in each workgroup is selected. If two or more agents share the same value of perceived productivity, the program randomly fires one of them. The vacant positions can be filled either by internal promotion or by external hiring. This can by described by assuming two mechanisms of filling a given empty post, each with probability being a part of the model. First, there is a probability that the post will be filled by externally hired agent, with values of and drawn from the same distributions as the original set of employees. The second option of filling a vacancy is through direct promotion of the best performer (again, we measure perceived performance!) of the organizational level directly below the vacancy. In any case, when two agents have the same perceived performance, the one for promotion is chosen randomly. In presented simulations we have used 10% probability of external hiring. The actual values of parameter vary considerabley between organizations, moreover, in real life that vary between varius levels within an organization. For some types of positions (for example sales management and high level management in commercial companies) the external hiring would be much more probable. On the other hand in education, research or production companies, internal promotion is dominant. The choice of the value of resulted from intention to keep influence of Peter Principle rather high. In presented results we used global promotion scope, where anyone from the lower level can be picked to fill the vacated post. The promotion will, of course, leave another vacancy to be filled at a lower level. The hiring process should start at the highest vacancy and continue down. All the vacancies at the lowest level are, obviously, filled by external hiring. where denotes agents capacity on the higher level. We assumed that has normal distribution centered at zero with width of (we used value of 0.2 for in results presented in this paper). This hypothesis would be applicable to situations where the tasks at the higher hierarchy level are largely similar to those at a lower level (advancement from programmer to programming team leader, for example). Depending on the organization the change of the scope of activity due to promotion, from direct production (writing the code, visiting customers, conducting experiments) to managerial tasks of organizing, planning and supervision may be more or less dramatic, pointing to Peter or continuity scenario. In some real life situations it might be suitable to use a mixed model (for example stressing the change of tasks when someone is promoted from the workpool to managerial levels), but this paper is limited to pure scenarios. We remind here that we keep the values unchanged for individual agents regardless of their promotions. During simulation process we are looking both at global changes of organization effectiveness depending on the promotion model as well as individual career paths and results of individual strategies . The simulation steps correspond to realistic conditions, e.g. quarters or semesters – periods where typically performance of employees is reviewed and firing/hiring decisions may be taken. We run the simulations up to 64 steps (16 years). By experience, modern commercial organizations stay in the same shape (without major reorganizations) for periods of 3-5 years. Such stasis times are longer in governmental and educational organizations. Of course, major reorganizations are not covered by the simplistic model described above. The individual results of the simulation runs differed significantly (as discussed in Section 3.1) and for each combination of parameters we have accumulated results of 8000 runs, to obtain averages and distribution of key characteristics. Overall performance of the organization, given by the averages of effective total result of the topmost manager and its changes during simulation steps, as well as effective performances of organization units at different levels, as given by their bosses' . We also recorded the number of new hires compared to internal promotions, to check the initial assumptions It is worth noting that these parameters are comparable to real world data, as such comparison could lead to improvements of the model (for example probabilities of external hiring depending on the level of the vacancy). Monitoring true productivity and self-promotion factor at various levels of the organization. Average for each level as well as the average value of raw individual productiveness were calculated at each step of the simulations; to check if it is the political manipulators or the real workers who move to the upper echelons, as suggested by common sense. The simulations were coded in Fortran95. The code is available from the Author on request. The model presented in this work is rather complex, involving several parameters designed to mimic at least some of the crucial aspects of modern organizational life. This complexity, however, makes deriving clear dependencies rather difficult. For the purpose of this preliminary paper we decided to divide the system controls into two groups. The first contains those that are static between various simulations, for example the parameters describing the distributions of and . We have also kept the firing rate and the external hiring rate fixed and selected to to keep the “simulation time” as close as possible to the real world, and to obtain reasonable values of the churn ratio and average time spent as given position. The second group contained controls that were varied between simulated organizations, describing their main characteristics: number of levels and workgroup size, type of post-promotion efficiency model (Peter hypothesis, continuity model) and organization susceptibility to self-promotion, . We present here results for a multi-level hierarchy comprised of 5 levels with 5 people in a workgroup. This choice was motivated by a desire to keep the overall size moderate. Based on the distribution of and defined in Section 2, we can derive two “yardstick” measures of the total organization productivity. The first, is the average productivity in a wholly random organization, including the negative effects of time and effort lost on political games. The value for random distribution is, with our choice of parameters, rather low, equal to 105 (Eq. 4). This is, of course, due to the largely negative impact of the managerial structure, where every manager decreases the production of his/her department by a factor of (0.7 for our choice of parameters). This value is also a starting point of the dynamic simulations, as the initial conditions use random distribution of agent characteristics. It should be noted that the random configuration and associated productivity seems highly unrealistic, as it means that all managers negatively influence the outcome. For this reason, we have used productivity of neutral organization as the criterion of the improvement vs. decline of the total output in the simulations. Interestingly enough, some combinations of parameters resulted in simulation runs that were worse than the random one. We should remind here that negative selection is real, and some organizations may indeed seem to perform worse than if they were staffed through random hiring. This is especially true if the organization itself is under no threat to its existence nor in competition, as is often true for government structures. The other, more realistic measure of global effectiveness, which we would call “neutral productivity”, assumes that no self-promotion take place ( ) and that all workers and managers have the same effective . Then the organization's output is simply given by the number of lowest level workers (as managers neither improve nor diminish the results). In the case of the 5-by-5 structure . 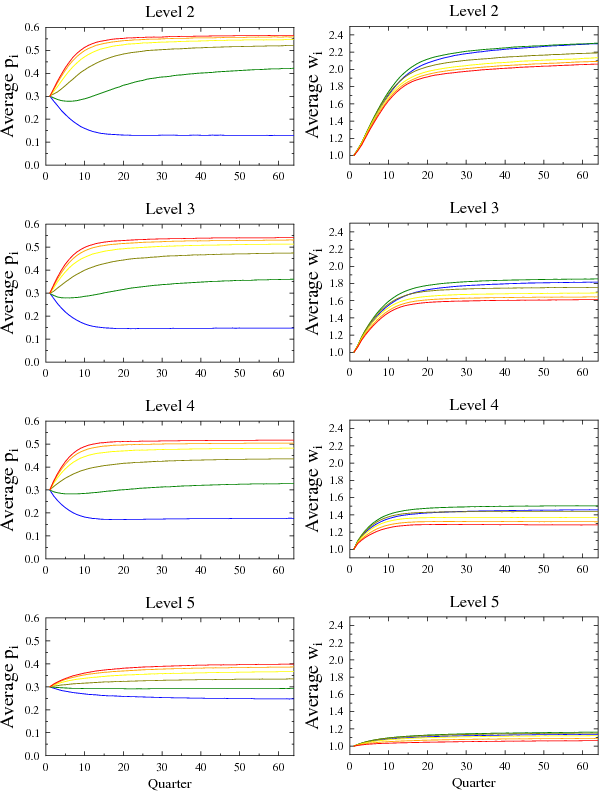 Despite the fact that in all simulations the pool of agents' individual capabilities remained the same, the final long term results of the model organization, depending on the post-promotion productivity scenario and the susceptibility to self-promotion varied by almost an order of magnitude, from much below to more than four times better than this value! Due to the multiplicative way the managerial contribution is modeled here, the influence of individual characteristics of managers, especially at high positions, can significantly change the overall productivity of the organization. As a result we observe rather wide distribution of results between simulation runs. As an example, Figure 1 presents distribution functions of overall productivity for the Peter model for various values of the susceptibility factor , at different stages of the evolution starting from random configuration: after 3, 5 and 16 years. 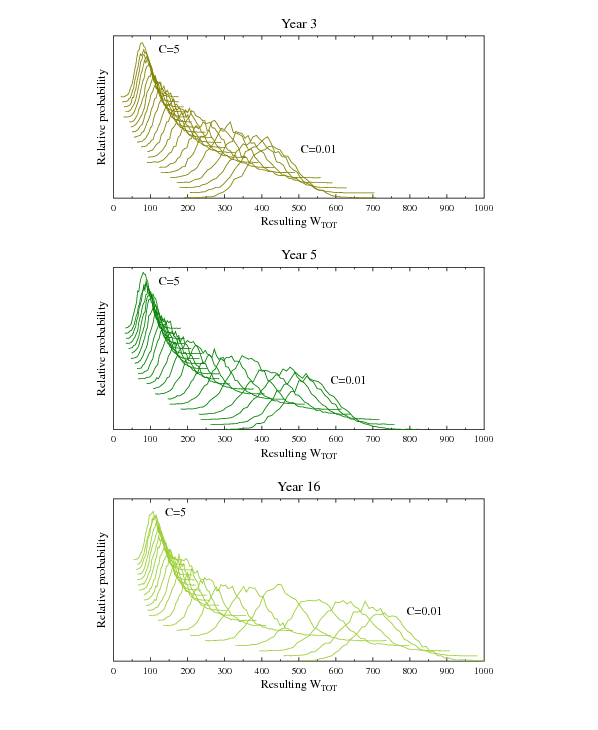 Figure 2 presents similar data for a set of simulations in the continuity model. Figure 1: Distribution of values for Peter model (organization with 5 levels with 5 positions in a workgroup) depending on value after 3, 5 and 16 years. Probabilities of are very well described by Gaussian distributions. Increased values of shift the center of the distribution to smaller values and decrease the width of the distribution – top left curves in each panel correspond to , bottom right to .The distributions were displaced vertically for clarity for increasing values. 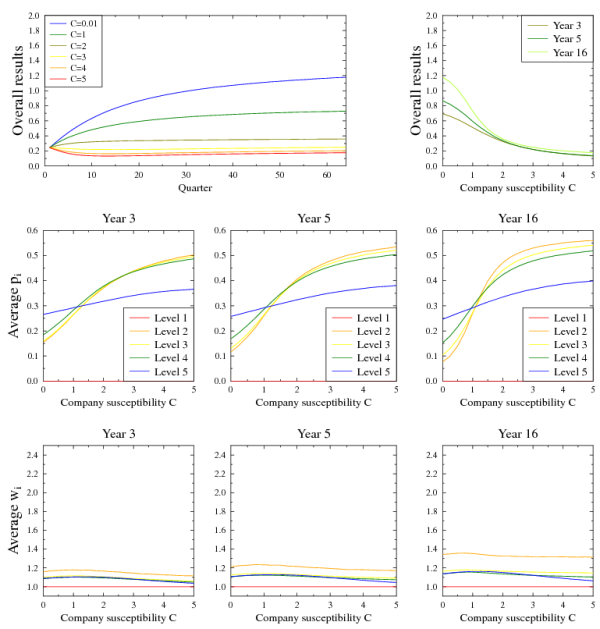 Figure 2: Distribution of values for continuity model (organization with 5 levels with 5 positions in a workgroup) depending on C value after 3, 5 and 16 years. Probabilities of are very well described by Gaussian distributions.The distributions were displaced vertically for clarity for increasing values. The distributions of are well described by Gaussian functions. This allows us to use, in presenting further results, peak center positions. It intersting to observe that the widths of the distributions are rather high and strongly correlated with the position of the peak center (Fig. 3). The half-width and half maximum (HWHM) varied between more than 20% of the average value for the Peter model, 3 years from the start of the simulations to still sizeable 10% for the continuity model after 16 years. 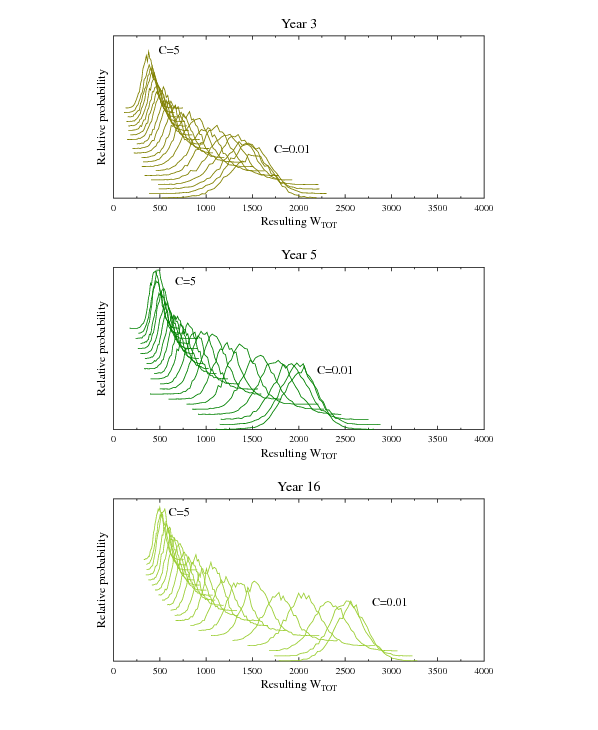 In the continuity model we observe strong reduction of the width of the distribution of with the passage of time, but even after 16 years of continuous evolution, there are still significant differences of results between individual simulation runs. We note here that the average values of and for organization level have similar Gaussian distributions. Figure 3: Correlations between the maximum of the distribution in multiple simulation runs and the width of the distribution. Point series correspond to situation after 3 and 16 years, and each series is given by different susceptibility values, ranging from at bottom left corner to at the top right corner. For very low values of the self-promotion is selected against, thus decreases with time for both continuity and Peter models. For large values of selection favors high political activity and thus grows. In the intermediate regime of we observe more complex behavior of , remaining close to the average value for random distribution. On the other hand, the true productivity in both models is observed to grow with time. Obviously this increase is much higher for the continuity model, where the promotion preserves, at least partially, the values, so that talent and competencies are not lost. 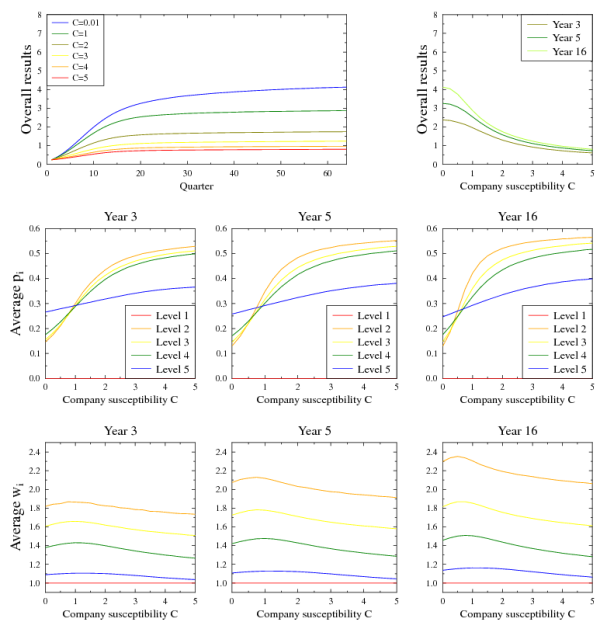 Figure 4: Time evolution of average and values for the continuity model; 5 levels of 5 positions in a workgroup. Colors correspond to various values of the susceptibility , ranging from (blue), through (green), (olive), (yellow), (orange) and (red). Figure 5: Time evolution of average and values for the Peter model; 5 levels of 5 positions in a workgroup. We shall focus now on the main model controls: the post-promotion effectiveness model (Peter or continuity) and the organization susceptibility to internal self promotion, . Both factors play a crucial role in the evolution of the organization effectiveness. Let us discuss first the differences between the two post-promotion models. The continuity model, even in the presence of strong susceptibility to internal PR, predicts improvement of the individual productivity with time at higher levels of organization. Selection of best (perceived) performers coupled with limited “inheritance” of the individual productivity significantly improves the average values, and as result, leads to much higher values of overall true productivity than in the Peter model. Figure 6: Comparison of overall organization effectiveness for the continuity and Peter models as function of susceptibility . 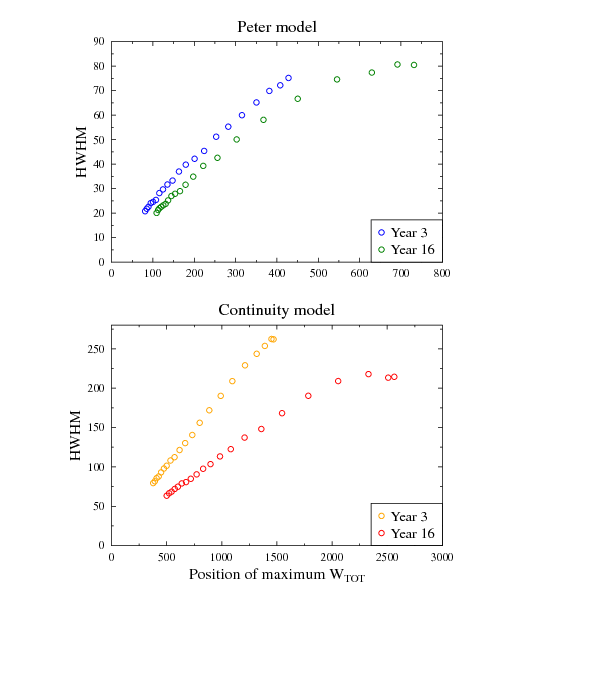 The difference between the productivity in continuity model and Peter model can be as high as 5 times, as shown in Fig. 6. Selection process for the continuity model, even for very large values of susceptibility (when agents with high focus on self-promotion are at advantage), leads to performance better than for the random assignment of agent capacities – but lower than the neutral configuration, when internal politics plays no role. For the Peter model at large values the evolution may lead to decrease of productivity from the starting random configuration! This seems to be a very bad sign for any organization. For some combinations of parameters this decrease, happening over a short period of less than 10 quarters, diminished the productivity by a factor of 2 (see, for example, Fig. 8). The following figures 7 and 8 show time evolution of average organization productivity (starting from a random configuration), dependence of this productivity on the susceptibility after 3, 5 and 16 years of evolution and similar dependence of the average and values at various levels of the organization. Overall productivity has been normalized to that of a neutral organization. Such normalization allows to see the effects independently to organization size and number of levels. For very small susceptibility values, the continuity scenario, with its positive selection of productivity gives results that are 4 times better than neutral organization, while for the Peter scenario the improvement in only by 20%. In both scenarios we observe strong, negative influence of increasing susceptibility on overall results. After 16 years, for the continuity scenario, the results are slightly below those of neutral organisation, while for Peter scenario the results are at the level of 15% of the neutral benchmark. This means that Dilbert Principle decreases productivity more than fivefold. Importantly, the drop of performance is significant even for relatively low values of = 2. Figure 7: Simulation results for the continuity model, 5 layers, 5 positions in a workgroup. 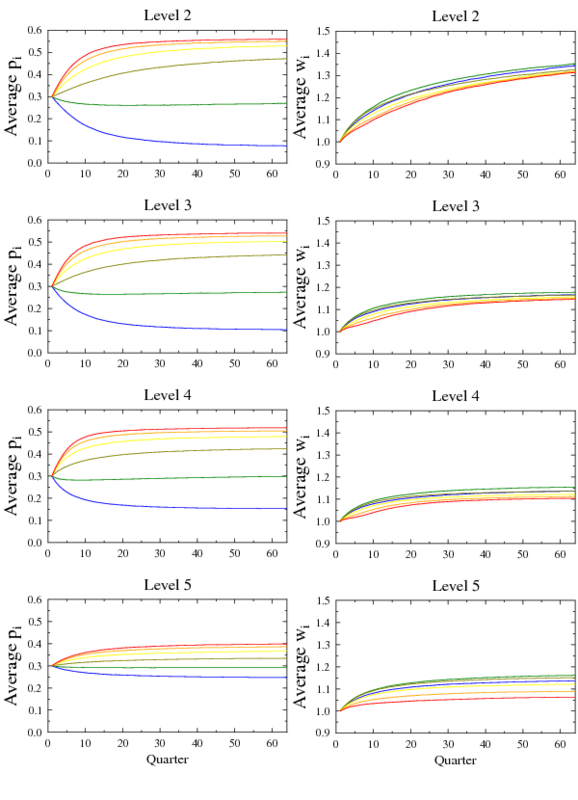 Upper panels: time evolution and dependence of overall productivity on organization susceptibility , divided by productivity of neutral organization of the same size. Lower panels: dependence of average and values on at the end of the third, fifth and 16th year of evolution. Figure 8: Simulation results for the Peter model, 5 layers, 5 positions in a workgroup. 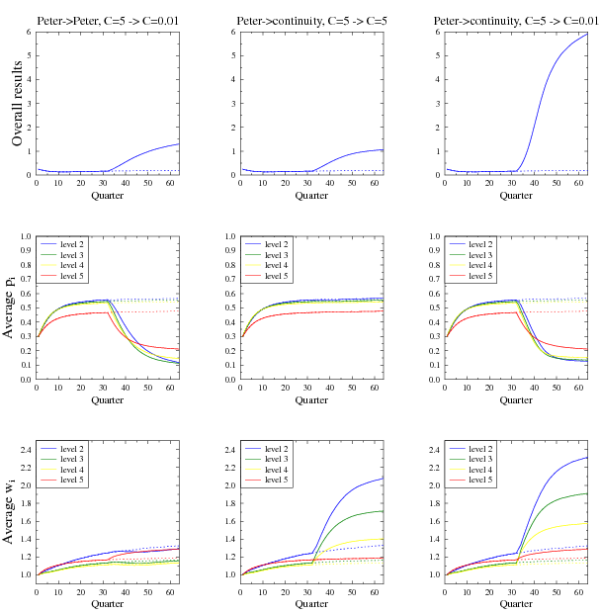 Upper panels: time evolution and dependence of overall productivity on organization susceptibility , divided by productivity of neutral organization of the same size. Lower panels: dependence of average and values on at the end of the third, fifth and 16th year of evolution. Using measurable and objective criteria for employee evaluation. This is relatively easy for some areas (for example in sales departments), but rather difficult in creative environments (scientific research, software engineering). Yet despite the difficulty, such standards would decrease the employee's drive to use political skills for self-promotion, instead of focusing on the needed tasks. Giving prospective candidates for promotion tasks related to the nature of duties at the higher level (e.g. temporary management of small groups, responsibility for analysis of results and preparing directions for action for workgroups and departments etc.) and measuring results of such assignments. These results should be used when considering promotion, as they estimate the productivity at the higher level, and thus decrease the effect of Peter Principle. Introduction of horizontal advancement paths, in which employees who do not fit into the traditional promotion model (for example brilliant engineers lacking managerial skills) would still be able to achieve satisfaction within a company, without falling prey to the Peter Principle trap. There is a large body of literature devoted to consequences of promotion models to individual and general organization productivity, including works that are focused on analysis of Peter Principle (for example Audas et al (2004), Barmby et al (2006), Dickinson and Villeval (2007), Gibbons and Waldman (2006), Koch and Nafziger (2007), Lazear and Rosen (1981), Lazear (2001), Lazear (2004), MacLeod and Malcolmson (1988), Valsecchi (2003) ). Most of these works consider the effects of promotions taking into account both the goals of the employer and the employee. The most important difference between the models used in the quoted sources and our simplified model, is that we did not cover the economic analysis on the employee side. There are no incentives for promotion - it is assumed that all employees, by definition, are interested in moving to higher positions. Such assumption is obviously far from the actual situations in real life, where some employees are risk adverse and prefer to stay in current positions. In our model we compare the relative perceived performance of agents at a given level of hierarchy as candidates for promotion. This is reminiscent of the tournament method of promotion selection (Lazear (1981)) as opposed to measurement of performance against a pre-defined standards. The difference in our model is that instead of comparing results of two workers we pick the best relative performers from a much larger pool of candidates. This has, of course a limitation to organizations where cross-departmental promotion is possible. It should be remarked here that even in the case of traditional tournaments Lazear (2001) has already predicted that in environments where there are "low quality" and "high quality" employees, the low quality employees would attempt to contaminate high quality firms. Direct inclusion of self-promotion in our model provides additional means for such corruption of quality. Additional limitation of our model is in stability of agent's "profile" in time. There is no increase of productivity at a given post with experience (as discussed, for example, by Koch and Nafziger (2007)). Nor do we introduce positive effects brought by training and learning. These effects are certainly important in real life. Providing newly promoted employees with training, coaching and allowing some "starting time", during which measurement criteria are somewhat relaxed, to gather experience are common actions of many organizations. They mitigate, to certain extent, the effects of Peter Principle, but in Author's opinion they can do little against Dilbert Principle and people who are focused on self-promotion. Thus, including self-promotion factor in productivity model diminishes the positive effects of greater experience in organization allows agents with high to attain high positions (by having large value of susceptibility ). Faria (2000) has presented an analysis of a combination of Peter and Dilbert Principles in a model describing suboptimal choices in an internal job market, with a split of managerial skills into technical and social. The proposed explanation of the origin of Dilbert Principle is different from ours. Faria assumed that organization could promote an employee who is below a competence optimum. Such choice would lead to the Dilbert Principle, but it is hard to understand, within the model proposed by Faria, why such suboptimal choice would be made. Although our model is more simplified than the one proposed by Faria (we do not split the skills into technical/social) it provides some quantifiable "explanation" for the wrong promotion decisions by the employer. Our notion of self-promotion is a practical realization of remark by Faria that if promotion decisions are made on the basis of proxies for the output rather than on measurable output, workers might put more emphasis on proxies than on output itself. Most of the traditional literature focuses on individual contributions to organization output. The total output is assumed to result from summing of outputs of employees. Thus, promotion decisions are based on tournaments which compare individual productivity. In many real life situations this is far from truth. Due to team nature of many tasks the evaluation of promotion criteria often depends not only on the direct contribution of an employee, but also on the contributions of all team members, for example subordinates. Sales manager performance is measured not on his or her individual results, but on sales of the group of people being managed. Research institute head repotation depends not only on what she or he publishes, but on cumulative research achievements of the institute. And so on. The comparisons of performance used in our model take such teamwork into account. However, as we already remarked, summing up individual contributions can not reproduce the possible negative influences of managers on team performance, unless we assume that negative outputs are possible. But even in the last case, additive model can not handle easily situations in which promotion of bad manager can have much larger negative influences simply because after promotion the manager may negatively affect the output of many more people. For these reasons we have opted for rather unusual multiplicative contribution model at management positions, which addresses the issues in a natural way. Within the simulation model, even a moderate decrease of the organization susceptibility to political ploys, and improvement of the “heritability” of skills after promotion may lead to dramatic improvement of overall productivity, not by single percentage points but by a significant factor. To show this we have simulated effects of changes in organization policies related to promotion and susceptibility to self-interests in a “mature” environment. In such simulations an organization resulting from some years of evolution under one set of parameters would be used as the starting point of a new simulation, for example with a changed value of . This would correspond to corrective measures undertaken by top management, for example when a new CEO comes on board. The main question of such studies would be to determine, for example, the expected improvements due to lowering of susceptibility or the time it takes to see such improvement take the effect. 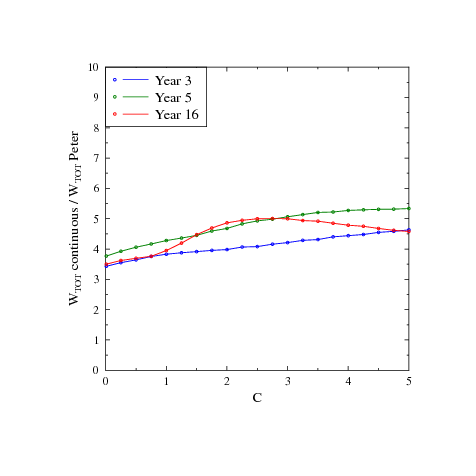 Figure 9 presents results of such simulations showing that the improvement of overall effectiveness due to both possible courses of action: decreasing susceptibility to self-promotion and changing the post-promotion scenario from Peter to continuity. We have arbitrarily assumed that the corrective measures are undertaken in the middle of the simulated period of 16 years, giving the organization the same amount of time to recover as the time of negative impact of Dilbert-Peter Principle. We studied corrective measures taken only against self-promotion, only against effects of Peter Principle and combined effort. The two corrective strategies, although leading to comparable individual improvements in total performance, act in different ways. Diminishing company susceptibility to self-promotion decreases , leaving resulting individual productivities almost unchanged. Changing post-promotion model from Peter to continuity (achieved, for example by suitable training and/or screening of promotion candidates with respect to tasks on the higher hierarchy level) increases , leaving self-promotion unchanged. In the case when both actions take place the increase of effectiveness is as high as by a factor of 20 for the chosen parameters. What is important is that the improvement in productivity happens rather fast, so that there can be a positive feedback, showing to top management that the decisions are bearing fruit and strengthening the resolve. Our model focuses on negative effects of Peter Principle and distortion of the observed output of employees due to self-promotion. The improvement strategies described above obviously miss other actions, such as education and training, which would result in improvement of employee productivity at current post. Such actions are especially important in promotion situations, to combat the decrease of productivity due to Peter principle, but they are beyond the scope of the simulations presented here. Figure 9: Changes in overall organization performance (compared to neutral organization) and average values of and due to changes in organization policies. Starting organization is highly ineffective: has very high susceptibility to self-promotion and uses Peter model of post-promotion effectiveness . The effectiveness of such organization, as already noted is very low. Left column: after 8 years of evolution the company changed the susceptibility to minimal value , resulting in rapid decrease of the self-promotion. Middle column: the company changed the post-promotion model to continuity scenario, without changing , resulting in improvement of the productivity. Right column: the company changed both the post-promotion model from Peter to continuity and decreased from 5 to 0.01. In the last case the cumulative effects led to dramatic increase of performance of the whole organization. Dotted lines show results when no change is introduced. The initial model presented here can be expanded in several directions. The best source of improvement of the model would be when the computer simulation could be coupled with some “microscopic” sociology studies (for example interviews focused on measuring the payoff of political activities within the organization). Especially, if one could provide comparative studies of general effectiveness of organizations built upon different social models. The model itself is quite flexible and allows many improvements. Such extensions of the computer model would still miss the effects due to individuality of participants and specific nature of the organization but bring the simulated strictures still closer to reality. To make the model more realistic one might divide the organization into a few 'divisions'. Promotion within a division (e.g. sales, marketing, manufacturing) should be based on a common sense hypothesis, as a lot of workload remains the same, so the effective results should be changing only partially. On the other hand, promotion across the departments should be less frequent and the new value of raw productivity would be totally uncorrelated. Yet another direction of further research is the study of dependence of overall output and effectiveness per employee in a growing organization – as most of real life organizations are dynamically changing their size. The model can also be improved by including effects evaluation of potential candidates for hiring and of employee dissatisfaction and restlessness when they are not promoted. It is relatively easy to include effects of pre-screening of external candidates, for example by choosing the best agent from several candidates. This improves the quality even if the number of reviewed candidates is as small as 4. Of course, in the spirit of the current work, the compared quality would be properly normalized perceived potential performance, given, for example by . There is, however, another process which counterbalances such gains due to pre-screening. In the current paper, the external candidates come from an infinite pool of agents with random characteristics. In real life they would be the people from appropriate levels of other organizations (usually quite similar to the studied one). By symmetry, these effects should be included in the study: a process of agents leaving the company to join other ones. In contrast with firing of the worst perceived performers, here the agents most likely to leave would be the ones who have relatively high opinion of themselves and willingness to seek new opportunities. These qualities, in the first approximation are related to the self-promotion drive The probability should increase with time spent at the same position. As a result, increases of productivity introduced by the pre-screening of external candidates would be counterbalanced by the outflow of the restless, disgruntled employees. The extensions mentioned above could allow the model to be used for concrete organizations. This would provide more practical value, extending beyond the current conclusions that combating the Peter scenario and self-promotion may quickly and significantly improve real productivity of organizations. ADAMS, S. (1996). The Dilbert Principle. Harper Business. BALL, P. (2004). Critical mass: How one thing leads to another. Farrar Straus Giroux. BARMBY, T., EBERTH, B. & MA, A. (2006). Things Can Only Get Worse? An Empirical Examination of the Peter principle. University of Aberdeen Business School Working Paper Series. http://www.dur.ac.uk/resources/dbs/research-papers/TimBarmby27Feb09.pdf. DICKINSON, D. L. & VILLEVAL, M-C. (2007). The Peter Principle: An Experiment. IZA Discussion Paper No. 3205, Institute for the Study of Labor (IZA), Bonn, Germany . FARIA, J. R. (2000). An Economic Analysis of the Peter and Dilbert Principles. Tech. rep., UTS Working Paper No. 101. http://www.business.uts.edu.au/finance/research/wpapers/wp101.pdf. KOCH, A. K. & NAFZIGER, J. (2007). Job Assignments under Moral Hazard: The Peter Principle Revisited. IZA Discussion Paper No. 2973, Institute for the Study of Labor (IZA), Bonn, Germany. LAZEAR, E. (2001). The Peter Principle: promotions and declining productivity. Tech. rep., NBER Working Paper No. 8094. http://economics.uchicago.edu/download/peterprinciple.pdf. PETER, L. & HULL, R. (1969). The Peter Principle. William Morrow and Company, New York. PRITCHARD, R. (1990). Measuring and improving organizational productivity: A practical guide. Praeger Publishers, New York. US SMALL BUSINESS ADMINISTRATION, (2008). Table of Small Business Size Standards. http://www.sba.gov/idc/groups/public/documents/sba_homepage/serv_sstd_tablepdf.pdf.